Scorpions are arthropods, arachnids who make up taxonomic order Scorpiones. 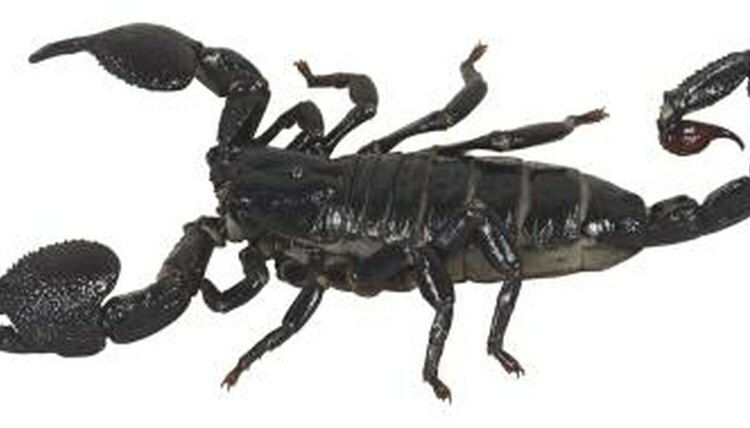 Within Scorpiones are 13 families of scorpions comprising more than 1,700 distinct species. A few species reproduce asexually, but most scorpion reproductive cycles have a single basic pattern. When male and female scorpion mate, they perform an elaborate dance, locking claws. At one point, the male deposits a sac containing sperm on the ground, then guides the female over it so she can take it in. Once this occurs, the two animals go their separate ways -- or the female may attack and kill the male after mating. Unlike some other arthropods, the female scorpion does not lay eggs. She keeps the fertilized eggs inside her body until they hatch, at which point the baby scorpions emerge and cling to her carapace. They will remain with the mother until the first molting period, at which time their exoskeletons will become strong enough that they can survive on their own without protection.